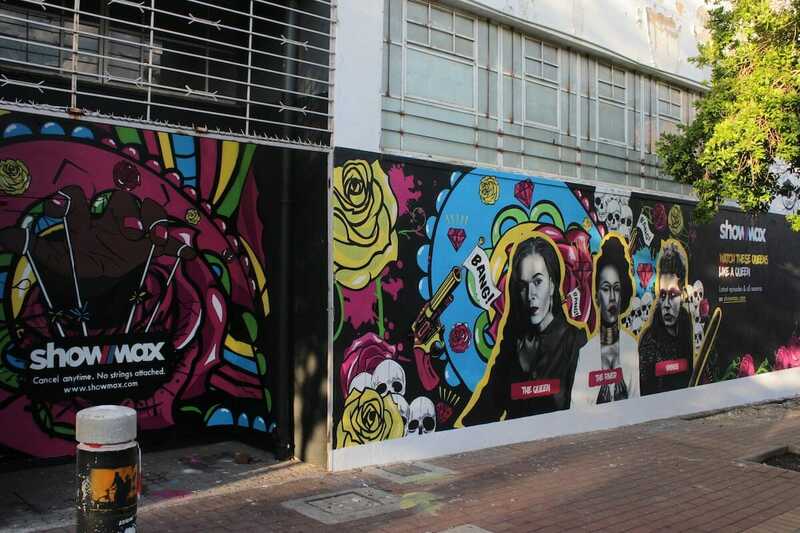 As part of a recent marketing campaign, Showmax approached South African graffiti artists to interpret Showmax in their own style. The resulting wall murals, which appeared across the country, all have their own unique flavour. We sat down with two of the artists behind the art to find out a little more about them and their work. Stefan Smit from Johannesburg conceptualised and painted the piece in Soweto. Stefan Smit is a fine artist working with oil paint and spray paint while Buntu Fihla aka “Bief37” has been actively writing graffiti since 1999. What’s your moniker and how did that name come about? Stefan: I first studied classical and contemporary piano so my tagline “These10Fingers” is a little nod towards that and the fact that my process of creation, no matter how conceptual, always end in the tips of my fingers so I guess it’s a little double entendre. Bief37: The name is from a combination of my initials and nickname. I was already writing the number 37 before I started doing graffiti because of my fascination with it based on its cryptic and typographic qualities. The swirls and abstract marks represent the unbound potential and energy encompassing Showmax at the centre of this vortex of life. What is it about graffiti as an art form that appeals to you? Stefan: I really enjoy the opportunity for freedom of movement through sheer size. When you’re painting the side of a building it’s incredibly liberating to be able to attack your surface with all the energy you have! Bief37: The thing that appeals to me the most about graffiti is its transformative effect in places where transformation is needed. How did you get started in graffiti? Stefan: A friend suggested we paint an open wall to try it out and it instantly hooked us! Bief37: My first exposure to graffiti was through early childhood hip-hop videos from America and Europe. Then in 1993/94 I saw a music video by a local group (Prophets of da City) that showed a time-lapse of a graffiti piece – done by the godfather of South African graffiti himself “Gogga the Devastator”. I became obsessed with graffiti then and there. Tell us a bit about your process when creating a new piece? Stefan: I’ll spend a good amount of time painting the piece in my head, after planning the design and placement. By doing this I free myself up to not have to make too many decisions during the execution and rather focus purely on the process of creation. Bief37: Depending on the nature of the piece, I would first consider the dimensions of the wall/object it will go onto. Then I make a sketch and outline with all the style and colour notes that will guide me when I am painting. Once painting starts, it’s all about layering the different colours and linework on, then the final step is composing the picture. 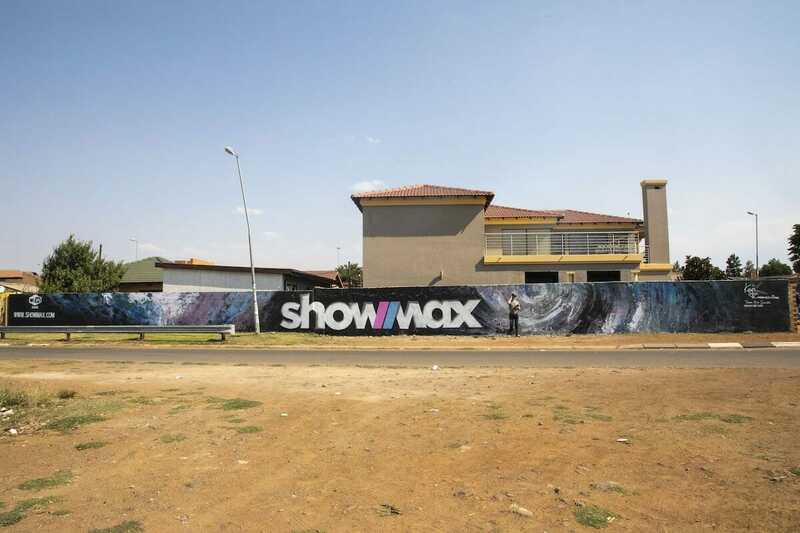 What was your inspiration behind the Showmax piece? Stefan: In all of my artwork there’s a certain element of chaos that I always deliberately add to the attention to detail because it’s a silent nod to the duality within everything. The swirls and abstract marks represent the unbound potential and energy encompassing Showmax at the centre of this vortex of life. Bief37: I was really inspired by the creative brief I received from Showmax. I enjoyed the relative creative freedom it gave me to express my graffiti work. I was most impressed by the creatives at Showmax for their selection of references that were critical in guiding the artist on the type of campaign they wanted to do. The direction I saw taken by the campaign was the deal breaker. What has the response been to your work? Stefan: Overwhelmingly positive! Since I started I’ve been invited to paint in countries like Dubai, Denmark, Sri Lanka and had some amazing opportunities to work for great clients like Sony, Nike, South African Breweries and MTN among others. Bief37: Varying. Most times people appreciate the colours and expressions of graffiti, sometimes people find it to be an intrusion of their public space. It is mostly dependent on the location and public. Stefan: I just finished a one-night solo exhibition of my work, which was a great success as I sold almost all the work in a very short space of time but the next project on the cards involves my sponsor Daler Rowney and doing a very large mural in oil paint. Bief37: I constantly do graphic design/corporate identity work and a few mural commissions. I am currently photographing different subjects and locations and doing research at the Amathole Museum in King William’s Town for a small catalogue publication on one of my series. I also run an NPO with a group of colleagues and community members (Phakamisa, King William’s Town) that offers murals, projects and artist support in our area. Stefan: I’m very active on Instagram: @These10Fingers or they can see my website: www.stefansmit.co.za. 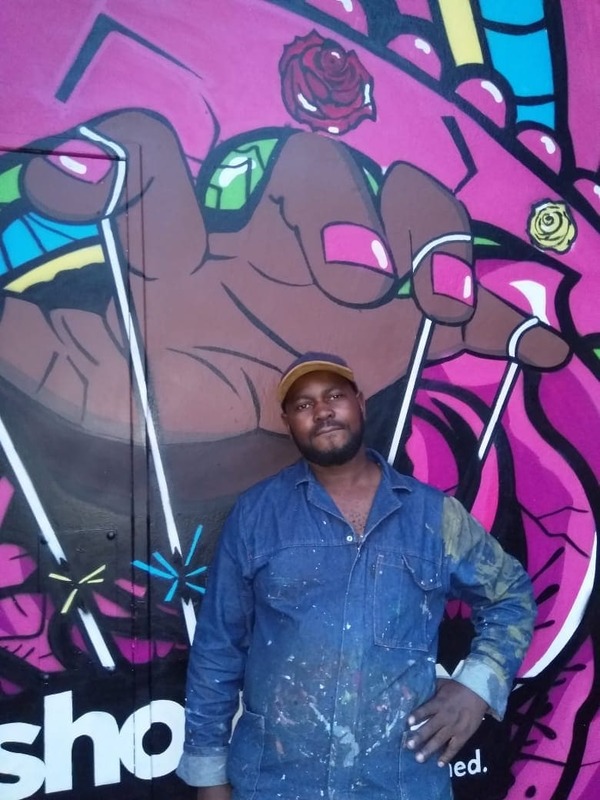 The Maboneng piece was conceptualised and painted by Bongani Kunene, pictured here. Bongani is from Tembisa, eKurhuleni. This Maboneng piece was conceptualised and painted by Bongani Kunene. This piece in uMlazi, KZN, was conceptualised and painted by Buntu Fifla, who is from Port Elizabeth, Eastern Cape. This Gugulethu piece was conceptualised and painted by Bongani Kunene (Tembisa, eKurhuleni). 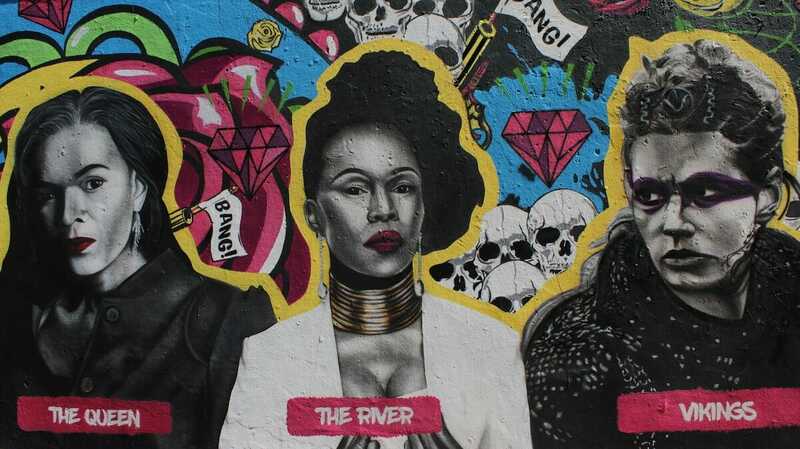 The Soweto piece was conceptualised and painted by Stefan Smit, from Johannesburg.